This Website and the materials within it are © 2012 Michigan Maintenance Supply Company, Inc. ("MMS"). Viewing this Website creates a copy of MMS materials in your computer's random access memory and/or in your hard drive and/or in your proxy server. MMS grants you permission to view this Website and to print individual pages from this Website for your own personal, noncommercial use, provided that you agree to and accept without modification the notices, terms and conditions set forth in this agreement. You may not modify, copy (except as set forth in the preceding sentence), distribute, transmit, display, perform, reproduce, publish, license, create derivative works from, transfer or sell any information, material, software, products or services from this Website. Your use of this Website constitutes your agreement and acceptance without modification of the notices, terms and conditions set forth herein. In addition, as a condition of your use of this Website, you represent and warrant to MMS that you will not use this Website for any purpose that is unlawful, immoral or prohibited by these terms, conditions and notices. If you do not agree and accept without modification the notices, terms and conditions set forth herein, do not use this Website. Other than this agreement and agreements between you and MMS relating to the sale of products or services to you through this Website, MMS will not enter into any agreement with you or obligation to you through this Website and no attempt to create such an agreement or obligation will be effective. The trademarks, service marks and logos (the "Trademarks") used and displayed on this Website are registered and unregistered Trademarks of MMS and others. Nothing on this Website should be construed as granting, by implication, estoppel or otherwise, any license or right to use any Trademark displayed on the Website, without the prior written permission of the Trademark owner. MMS aggressively enforces its intellectual property rights to the fullest extent of the law. The name of MMS, MMS logo or the other MMS formatives may not be used in any way, including in advertising or publicity pertaining to distribution of materials on this Website, without prior, written permission from MMS. MMS prohibits use of MMS logo as part of a link to or from any site unless establishment of such a link is approved in advance by MMS in writing. Fair use of MMS's Trademarks requires proper acknowledgment. Other product and company names mentioned in this Website may be the Trademarks of their respective owners. While we will use our best efforts to fulfill all orders, MMS cannot guarantee the availability of any particular product displayed on this Website. MMS reserves the right to discontinue the sale of any product listed on this Website at any time without notice. The prices displayed on this Website are quoted in United States dollars. Such prices do not include shipping and handling or sales taxes, if applicable, which will be added to your total invoice price. You are responsible for the payment of any shipping and handling charges and state and local sales or use taxes that may apply to your order. While our goal is a 100% error-free Website, we do not guarantee that any content is accurate or complete, including price information and product specifications. If we discover price errors, they will be corrected on our systems, and the corrected price will apply to your order. MMS reserves the right to revoke any stated offer and to correct any errors, inaccuracies or omissions (including after an order has been submitted and accepted). Please read our Product Return Policy carefully. This Website may contain links to Websites owned or operated by parties other than MMS. Such links are provided for your reference only. MMS does not control outside Websites and is not responsible for their content. MMS's inclusion of links to an outside Website does not imply any endorsement of the material on the Website or, unless expressly disclosed otherwise, any sponsorship, affiliation or association with its owner, operator or sponsor, nor does MMS's inclusion of the links imply that MMS is authorized to use any trade name, trademark, logo, legal or official seal or copyrighted symbol that may be reflected in the linked Website. MMS also may make employment information available through this Website. MMS is an equal opportunity employer. MMS provides equal employment opportunity to qualified persons without regard to race, color, religion, gender, sexual orientation, national origin, age, veteran status or disability. MMS's policy relates to all phases of employment including recruitment, placement, promotion, training, demotion, transfer, layoff, recall and termination, rates of pay, employee benefits and participation in all company-sponsored employee activities. THE INFORMATION AND MATERIALS IN THIS SITE ARE PROVIDED FOR YOUR REVIEW IN ACCORDANCE WITH THE NOTICES, TERMS AND CONDITIONS SET FORTH HEREIN. THESE MATERIALS DO NOT NECESSARILY REFLECT THE OPINIONS OF MMS OR ANY OF ITS AFFILIATES OR AGENTS. THESE MATERIALS ARE NOT GUARANTEED OR REPRESENTED TO BE COMPLETE, CORRECT OR UP-TO-DATE. YOU MAY NOT ACT OR RELY ON ANY INFORMATION OR MATERIALS IN THIS SITE AND YOU PARTICULARLY SHOULD NOT MAKE ANY INVESTMENT DECISIONS BASED ON ANY INFORMATION OR MATERIALS IN THIS SITE. YOU MUST INDEPENDENTLY VERIFY THE ACCURACY OF ALL SUCH INFORMATION AND MATERIALS BEFORE ACTING OR RELYING THEREON OR MAKING ANY INVESTMENT DECISIONS IN CONNECTION THEREWITH. THESE MATERIALS MAY BE CHANGED FROM TIME TO TIME WITHOUT NOTICE. MMS MAKES NO REPRESENTATION ABOUT THE SUITABILITY OF THE MATERIALS ON THIS SITE FOR ANY PURPOSE. ALL SUCH MATERIALS ARE PROVIDED "AS IS" WITHOUT WARRANTY OF ANY KIND, EXPRESS OR IMPLIED. MMS SPECIFICALLY DISCLAIMS ALL WARRANTIES AND CONDITIONS OF ANY KIND, INCLUDING ALL IMPLIED WARRANTIES AND CONDITIONS OF MERCHANTABILITY, FITNESS FOR A PARTICULAR PURPOSE, TITLE AND NON-INFRINGEMENT. MMS SHALL NOT HAVE ANY LIABILITY OR RESPONSIBILITY FOR ANY ERRORS OR OMISSIONS IN THE CONTENT OF THIS SITE, FOR YOUR ACTION OR INACTION IN CONNECTION WITH THIS SITE OR FOR ANY DAMAGE TO YOUR COMPUTER OR DATA OR ANY OTHER DAMAGE YOU MAY INCUR IN CONNECTION WITH THIS SITE. YOUR USE OF THIS SITE IS AT YOUR OWN RISK. IN NO EVENT SHALL EITHER MMS, ITS AFFILIATES OR AGENTS BE LIABLE FOR ANY DIRECT, INDIRECT, PUNITIVE, INCIDENTAL, SPECIAL OR CONSEQUENTIAL DAMAGES ARISING OUT OF OR IN ANY WAY CONNECTED WITH THE USE OF THIS SITE, THE MATERIALS IN THIS SITE, THE DELAY OR INABILITY TO USE THIS SITE OR OTHERWISE ARISING IN CONNECTION WITH THIS SITE, WHETHER BASED ON CONTRACT, TORT, STRICT LIABILITY OR OTHERWISE, EVEN IF ADVISED OF THE POSSIBILITY OF ANY SUCH DAMAGES. 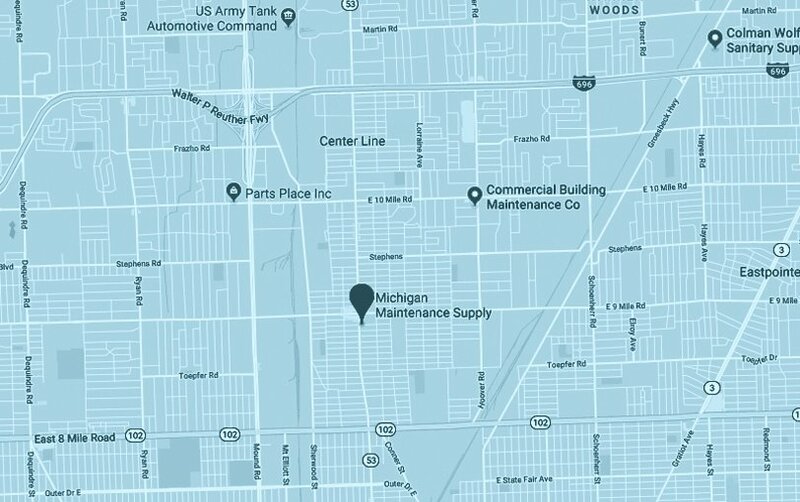 Michigan Maintenance Supply Company, Inc. Although MMS will in most circumstances be able to receive your e-mail or other information provided through this Website (including, without limitation, service requests and other submissions), MMS does not guarantee that it will receive all such e-mail or other information timely and accurately and shall not be legally obligated to read, act on or respond to any such e-mail or other information. Be aware that Internet e-mail typically is not secure. This Website resides on a server in the United States. You agree that this agreement and your use of this Website are governed by the laws of the United States. You hereby consent to the exclusive jurisdiction and venue of the courts, tribunals, agencies and other dispute resolution organizations in the United States in all disputes (a) arising out of, relating to, or concerning this Website and/or this agreement, (b) in which this Website and/or this agreement is an issue or a material fact, or (c) in which this Website and/or this agreement is referenced in a paper filed in a court, tribunal, agency or other dispute resolution organization. Use of this Website is unauthorized in any jurisdiction that does not give full effect to all provisions of this agreement, including without limitation this paragraph and the warranty disclaimers and liability exclusions above. MMS has endeavored to comply with all legal requirements known to it in creating and maintaining this Website, but makes no representation that materials on this Website are appropriate or available for use in any particular jurisdiction. Use of this Website is unauthorized in any jurisdiction where all or any portion of this Website may violate any legal requirements and you agree not to access this Website in any such jurisdiction. You are responsible for compliance with applicable laws. Any use in contravention of this provision or any provision of this agreement is at your own risk and, if any part of this agreement is invalid or unenforceable under applicable law, the invalid or unenforceable provision will be deemed superseded by a valid, enforceable provision that most closely matches the intent of the original provision and the remainder of the agreement shall govern such use. With the prior agreement of MMS, any claim, dispute or controversy arising out of, relating to or concerning this Website and/or this agreement shall be decided by binding arbitration in accordance with the Rules of the American Arbitration Association and any such arbitration proceedings shall be brought and held in Macomb County, Michigan, USA. The decisions of the arbitrators shall be binding and conclusive upon all parties involved and judgment upon any award of the arbitrators may be entered by any court having competent jurisdiction. This provision shall be specifically enforceable in any court of competent jurisdiction. You agree that MMS may at any time and without notice change the terms, conditions and notices under which this Website is offered. You agree that no joint venture, partnership, employment or agency relationship exists between you and MMS as a result of this agreement or your use of this Website. MMS's performance of this agreement is subject to existing laws and legal process and nothing contained in this agreement is in derogation of MMS's right to comply with law enforcement requests or requirements relating to your use of this Website or information provided to or gathered by MMS with respect to such use. This agreement, the privacy and security statement, and terms of sale constitute the entire agreement between you and MMS with respect to this site. This agreement supersedes all prior or contemporaneous communications and proposals, whether electronic, oral or written, between you and MMS with respect to this Website. No modification of this agreement shall be effective unless it is authored by MMS, Inc. or its affiliates, or unless it is physically signed in blue ink by a MMS officer. Any alleged waiver of any breach of this agreement shall not be deemed to be a waiver of any future breach. A printed version of this agreement and/or of any notice given by MMS in electronic form shall be admissible in judicial or administrative proceedings based upon or relating to this agreement or your use of this Website to the same extent and subject to the same conditions as other business documents and records originally generated and maintained by MMS in printed form.